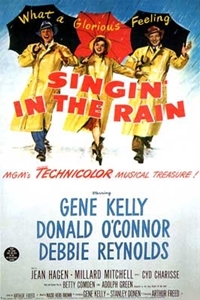 Gene Kelly, Debbie Reynolds and Donald O'Connor star in Singin' in the Rain, one of the greatest and most successful musicals ever filmed - filled with memorable songs, lavish routines and Kelly's fabulous song-and-dance number performed in the rain. Set during the advent of "talkies," Don Lockwood has risen to stardom during Hollywood's silent-movie era - paired with the beautiful, jealous and dumb Lina Lamont. And when Lockwood becomes attracted to young studio singer Kathy Selden, Lamont has her fired. But with the introduction of talking pictures, Lockwood finds his career in jeopardy after audiences laugh when they hear Lamont speak in her shrill voice for the first time... until the studio decides to use Selden to dub her voice.